LetТs consider the situation: it is necessary to organize automatic start of recording the programs being formed by the server in the mode of live broadcast by the playlist. Herewith, the SL NEO platform recorder that will receive the commands can be placed at the same server that forms the program, or at another server platform. 1. Select a separate column in the executable playlist and set a marker, by which the application will automatically form a new event in the rec-list, set a name for a new clip and form a command for the start of recording. 2. In another column of the executable playlist set the command for the stop of recording. As far as the live broadcast will consist of several events, the settings will be implemented in such a way that the record could be launched synchronously with the start of one selected event, and could be stopped by the start (or the stop) of another selected event in the playlist. This task can be implemented by using the system of rules and commands Actions of the SL NEO platform. The system of rules Actions can help the user to program the execution of certain actions by the server in case of triggering the set conditions. The condition for triggering the rule is the approach of a certain event in the playlist, the condition is set up in the process of configuring the rule. After the approach of a condition, the server executes the defined action. In our example, commands will be formed by the program channel (software module Program Channel) and broadcasted to the record service (Recorder). For forming a new event in the rec-list you should create a rule (Action) for the appropriate program channel (Program Channel), which, in case of the rule execution, will create in the rec-list a new line with the corresponding attributes and will launch recording. Further settings will be implemented from the control web-console of the server that forms the program. Choose the section Manage from the left menu of the console, find the item Program Outputs and the channel Program_1. Here choose the pt. Actions, then the tab Playlist events and press Add Action. Find the field Name in the section Action Configuration and enter a random name for the rule, in our example - REC Start. In the field Layer choose the layer that will generate commands. Choose У1Ф - the first full screen layer (the layer of the main playlist). In the field Address set the IP address of the server that has the appropriate functioning recorder, or leave the field empty, if the value is localhost. Press ... near the field Service - if the server with the specified IP-address is active, the list will display all available services of the server. Choose the record service for controlling - Recorder_1, press the button ... near the field Action and choose an action that will be executed in case of triggering the rule - Append Item. Implement adjustments in the section Action condition - here we set the condition for triggering the rule: Уif the value in the field GPI 1 V of the current playlist line is not empty, the rule will trigger simultaneously with the start of the main event.Ф. 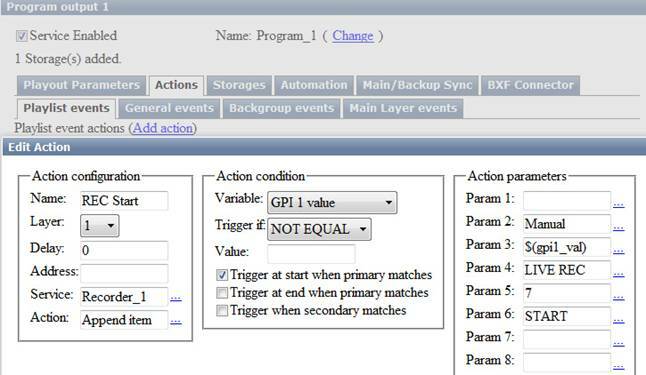 Implement configuring in the section Action parameters: in the field Param 1 you can set duration of the record event. So as we cannot specify the exact duration of a live broadcast, weТll leave this field empty. Set the type of start Manual for a record event in the field Param 2. Press ... near the field Param 3 and choose a playlist column, from which the application will read off the name for a new clip. For our example we choose the column GPI 1 V (GPI 1 Value). In the field Param 4 set the name of a folder in the server database that will store the clip, or leave the field empty - in this case the clip will be placed to the folder with the current date. In the field Param 5 set the Уlife timeФ of a new clip in days, or leave the field empty. In the field Param 6 specify an action for the recorder in case of triggering the rule - the start of recording, the command START. Adjustment of the rule is finished, press OK, then click the button Apply Changes at the upper section of the web-console. The configured program channel and recorder will be reloaded. To stop recording from a playlist, create a new rule for the appropriate program channel (Program Channel). Choose the section Manage from the left menu of the console, find the item Program Outputs and the channel Program_1. Here choose the pt. Actions, then the tab Playlist events and press Add Action. Enter the parameters in the opened window: find the field Name in the section Action Configuration and enter a random name for the rule. In the field Layer choose the layer that will generate commands. Choose У1Ф - the layer of the main playlist. In the field Address set the IP address of the server that has the functioning recorder, or leave the field empty, if the value is localhost. Press ... near the field Service and choose the record service for controlling - Recorder_1, press the button ... near the field Action and choose an action that will be executed in case of triggering the rule - Stop. Implement adjustments in the section Action condition - here we set the condition for triggering the rule: Уif the value in the field GPI 1 V of the current playlist line is equal УoffФ, the rule will trigger simultaneously with the start of the main event.Ф - recording will be stopped. Adjustment of the rule is finished - press OK, then click the button Apply Changes at the upper section of the web-console. The configured program channel and recorder will be reloaded. Now, after the implemented settings, recording will start and stop automatically, according to the commands in the columns GPI 1 and GPI V1 of the executable playlist (see the picture).